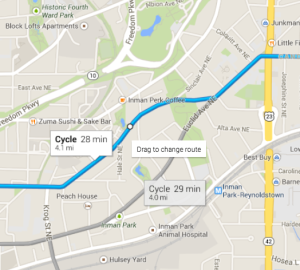 One of the best tools to plan a bike route is Google. It’s easy, familiar and pretty darn accurate on the first try. So let’s get started! Go to maps.google.com and enter your work address. Click directions and enter your starting point. Notice those cool little icon beneath the addresses? Click on the bike! Too simple. I show three different routes to get to work. The one highlighted in blue is your current active route and the others greyed out are alternates. By mouse clicking on the greyed routes they become “active” and their step by step instructions will appear on the left side. Now let’s zoom in a little bit. Let’s say there’s a turn your not too familiar or a road you’ve never been on. Street View is an ideal way to check it out. Trace the mouse along your route and over the segment in question. Click once on your route to bring up the Street View option. 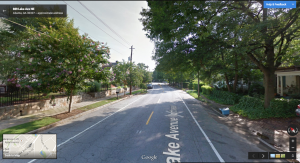 Notice the how the Street View icon appears under your home address? Give it a click and you’re in, free to look around and get a feel for road conditions, check to see if there are bike lanes* or try to imagine traffic conditions. A mouse click off into the distance zooms you ahead. Here’s something I just learned, one click is all that’s required to move around in Street View. “Okay whoa there, I’m not biking up that!” you say … No worries, that’s why we use Street View. Click on the lower left map icon to return back to the map view, we’re going to find an alternate route. Position your mouse close to the turn or street in question, click once, hold and drag the route to what you think will be a better option. Repeat the Street View steps as necessary. Dragging the route should be pretty intuitive, but sometimes it gets so messy you’ll have to start over. Once you have a map you’re happy with, hover over the addresses in map view and click the link “Step-by-step.” Here you can print a paper copy to take with you or save a PDF to download to your phone. Don’t forget to turn on the CycleAtlanta app before you go, and Happy Cycling! *Google Maps “Classic View” will actually show you where there are bike lanes. This option is available by adjusting your layers settings. While I do see the bike lanes when I’m using my tablet or phone, for whatever reason I’m not seeing them listed on my desktop. Weird… But Google is always changing so who knows.